The water management as you may say that it is in the way of the water management the rice plant making (cultivation method) from the rice field is very important. When the water management is bad, the growth of the rice plant is bad, the grass grows, the rice plant falls, and the paddy yield is bad. Generally, after replanting, water will be shoaled. And, an initial tiller is urged. The management of water afterwards is adjusted to 2-3cm. The water temperature of the rice field is improved and the growth of rice plant is pressed. The herbicide is scattered about one week after replanting. At that time, water is deepened. When the herbicide is scattered, water is not moved. Moreover, water is prevented from disappearing. In a word, a lot of water is put in. The shallow flooding should be good to press growth afterwards, and because the deep flooding is good so as not to grow the grass, the management method be changed according to the situation of the rice field. Depending on each farmer's idea around here. Might it not be limited that it always goes well, and water sometimes disappear though I am doing water management with easy water management .deeply.. The purpose to do the midsummer drainage is to send oxygen in the suppression of an excessive tiller, and the soil and to keep the root to be healthy. A part of the root of the rice plant is changed from the water root into the field root, and moreover, the soil is made hard, and there is an effect of making the rice plant easy not to fall. This rice field just ended the midsummer drainage, and put water in. [Konagi] of the weed has grown this year though the stock seems to grow, too and growth to be good. How though it is good for the place not defeated at the weed because the light of the sun doesn't hit the weed when the stock of the rice plant grows? The stock of the rice plant becomes about 20 or more, the flower seems to bloom as shown in this photograph, and the midsummer drainage is finished ahead a little become it. Water disappears completely by one degree, and the surface dries the midsummer drainage in the place by which the crack cracks. Water is put in at once afterwards. It is not possible to say indiscriminately because there are a rice field (water leak rice field) that dries up soon by the rice field and a rice field (ill-drained paddy field) that doesn't dry up easily for the period of the midsummer drainage. The water of the culvert is pulled out in the ill-drained paddy field, and the rice field is dried early. 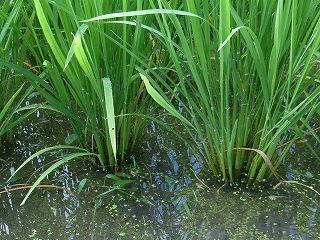 The rice plant falls if the ear begins to appear if the midsummer drainage is never done. The midsummer drainage is very important work for rice making. Especially, the kind of Koshihikari falls easily very much because the stature of the rice plant is long. It is necessary to do the midsummer drainage completely deliberately. After the ear goes out, the ear needs it, and moreover, the amount of transpiring from the leaf of the rice plant becomes a lot of time that is at time when it grows, and the ample fluid is needed for the rice plant. After the midsummer drainage, the determination water supply (intermittent irrigation and intermittent irrigation) becomes the best if it meets both these requirements. In a word, water is saved, and dried. The time of the midsummer drainage might come in succession according to the provinces at the time of the rainy season though the midsummer drainage becomes about an end of the rainy season around here. Should I stop water for a long time in consideration of it because I might do the role of the determination water supply among the rainfalls between rainy seasons and it is not possible to know. The root of the rice plant includes a thin, short field roots in fat, long water root and brown in white. The water root comes out from the rice plant that grows up in water chiefly. On the other hand, the rice plant that grows up in the field where water is a little becomes a field root. The water root completely changes into the field root if rice field is completely dried by the midsummer drainage. The field root starts changing into the water root again if water is put in afterwards. With this, the rice plant is confused. Because the midsummer drainage is made moderation, I think that you should gradually change a part of the root of the rice plant from the water root into the field root by the intermittent irrigation after ear emergence.